There are currently 4,690 users on this website. Chambon was the manufacturer of all reel-fed printing presses used by the French State Printers at Boulevard Brun in Paris. Presses for typography since the 1910-ies; presses for recess since the 1930-ies. 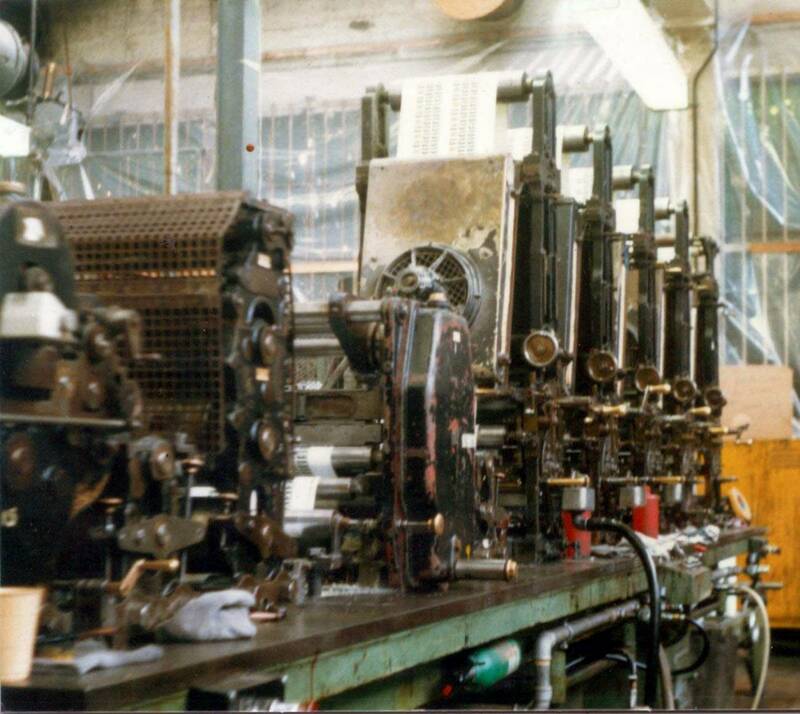 After World War II mainly known for their reel-fed photogravure presses and the peculiar perforation devices they had in-line. The (double) H-shaped comb perforation got well known by the New Zealand definitives printed by DLR. A.k.a. Chambon-perforation. The same type of perforation - although not so well-known - can be found by a lot of Israeli stamps printed at Hakirya on their Chambon. Is that list fairly complete? When I compare, there is basically no comparison. Well maybe Courvousier was close. Pity they closed down in 2001 after 70 years of stamp printing. results out of the Chambon press. 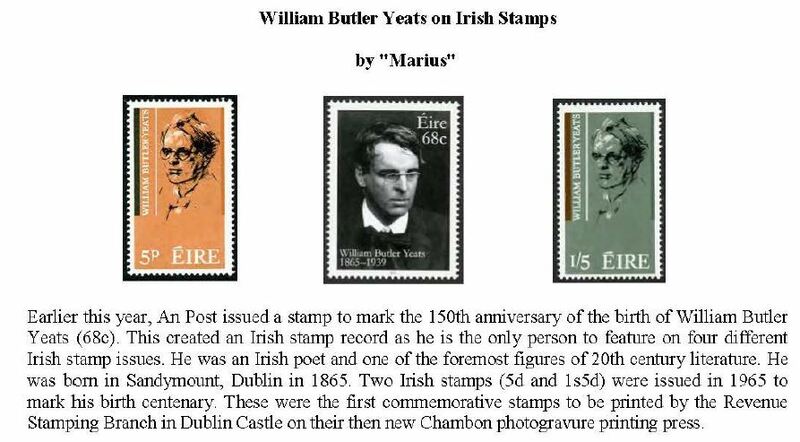 Just like the BEP with the Andreotti photogravure printed stamps which were terrible in my opinion. 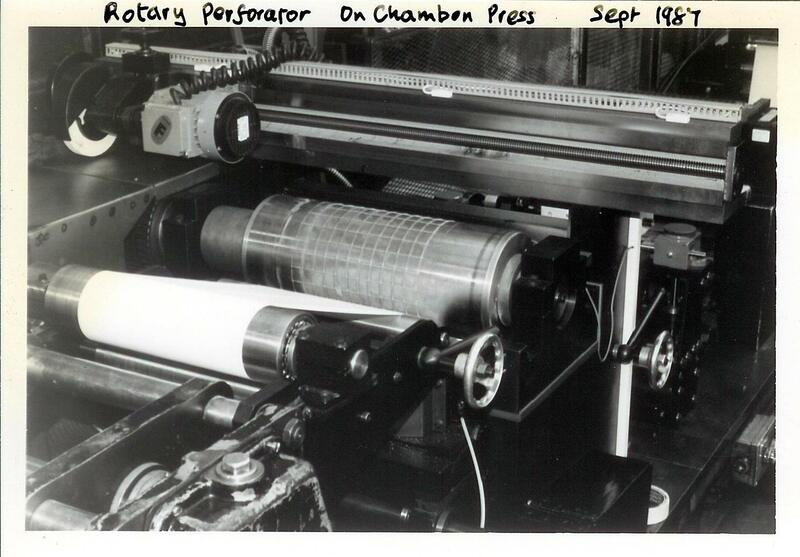 So during 1965-1981 the Irish stamps printed in photogravure, by the Irish Government Printers of the Stamping Branch of the Revenue Department (Later known as Irish Security Printers), were done on a Chambon press! Indonesia. 1955 [May 12]. Pertjetakan Kebajoran. 3 colours. Great Britain. Harrison and Sons. 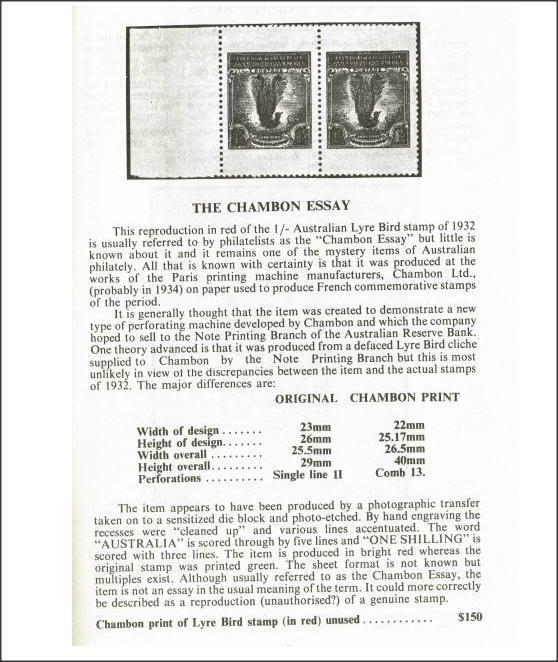 An undated British stamp article snippet states: "We first became aware of the Chambon Press in 1979 when the 10p stamp was issued in sheets with a central gutter. 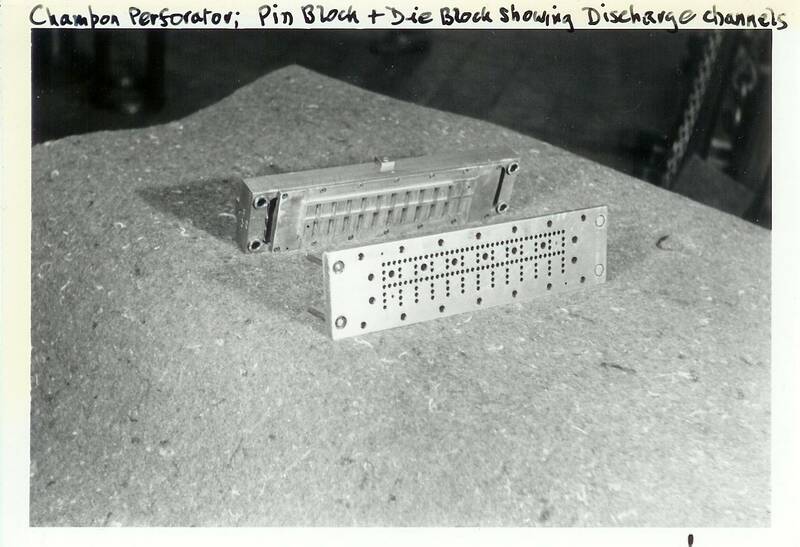 Previously the machine had been used for fiscal stamps such as Post Office telephone savings stamps." 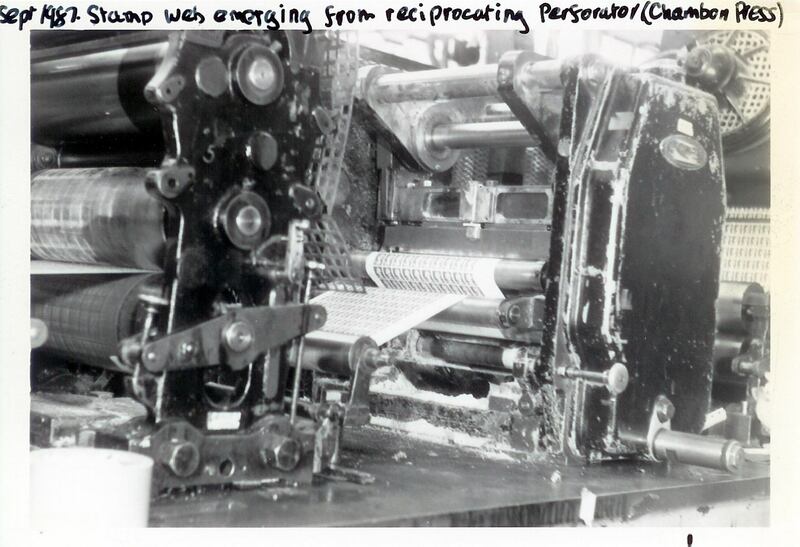 As for Ireland, the Stamping Branch had an association with Chambon presses going back to at least 1936 (but not photogravure presses at that time, nor were they used for printing postage stamps but postal orders and dog licences), so it is probably understandable that they would have chosen that press maker by the 1960s when requiring a photogravure press. Harrison & Sons Chambon press photographed in 1987. 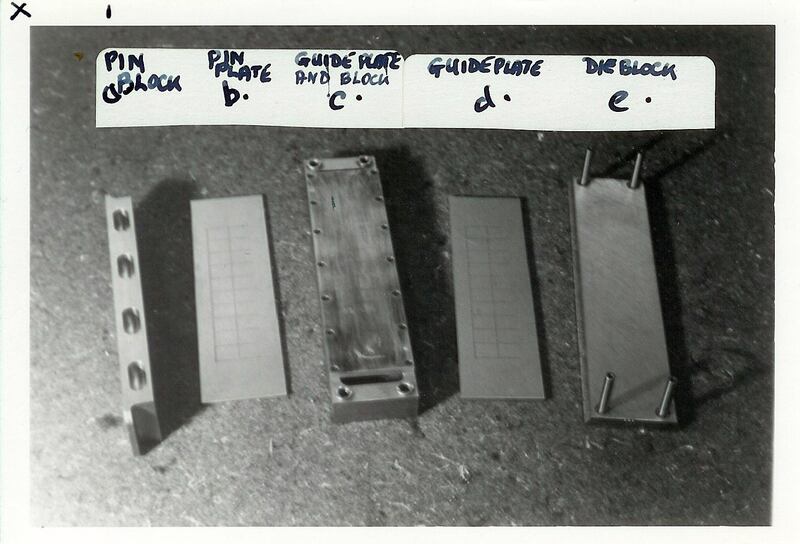 A series of images taken at Harrison in 1987. Captions at top of each image should generally be self-explanatory, although I have no idea what an "eccentric roller" (image 5) is! 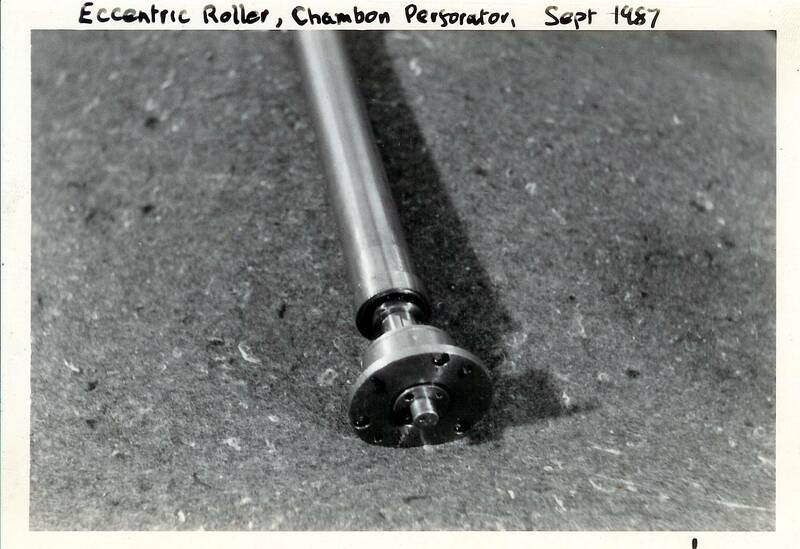 The surface of the roller, is offset to some degree, from the centre of the axle,causing a "wobble" effect on rotation. A camshaft in an internal combustion engine, would be an example.